Amazon Go is a new kind of store with no checkout required. We created the world’s most advanced shopping technology so you never have to wait in line. 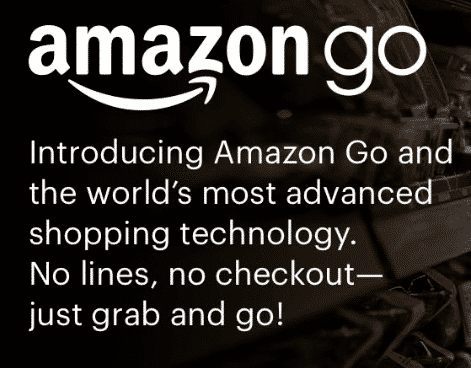 With our Just Walk Out Shopping experience, simply use the Amazon Go app to enter the store, take the products you want, and go! No lines, no checkout. Now they’re launching a brick and mortar grocery store in Seattle where you just scan your Amazon app on your phone when you enter, and then you get whatever you want from the store and just leave. That’s it. You just walk out of the store. They use cameras and sensors to track everything, and as soon as you leave the store they charge you for everything. This is a milestone in physical shopping the same way Uber was for rides. Apple Pay is great, but only compared to cash or credit cards. It basically simplifies the process of doing something physically to pay, but you’re still doing something physically to pay. The beauty of Uber is doing exactly nothing when you leave the car, and that’s what Amazon is showing us with this concept. As a security person I’m imagining the camera and sensor technology, and what the fraud and theft protection measures are going to look like, but as a consumer I’m completely enamored with this play. Apple Pay and similar offerings are not the future of payments—frictionless is the future. Let’s hope this helps get us moving towards in that direction.